The second leg of the 1872 Cup between Glasgow Warriors and Edinburgh Rugby will be played on 26 April at Scotstoun. 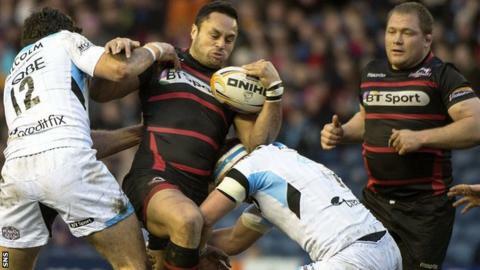 The date was confirmed as Edinburgh's RaboDirect Pro12 run-in was revealed by the league. Glasgow won the 1872 Cup first-leg 20-16 at Murrayfield thanks to a Stuart Hogg try. Edinburgh will play their last home league game of the season against Munster at Meggetland on 3 May. "We're delighted that our season run-in is now confirmed, with the details of some very important matches now set in stone," said Edinburgh Rugby managing director David Davies. "The 1872 Cup match against Glasgow Warriors is a huge match for vital league points against our biggest rivals." The original 1872 Cup second leg was scheduled for New Year's Day but was postponed due to a waterlogged pitch. Warriors are hoping to beat their previous attendance record of 8,852 for a game in Glasgow when Edinburgh visit, having increased the capacity of Scotstoun to around 10,000.